A new section at the Artstorm site will be launched within the next few days. It’s about my software development projects. I wanted to clearly separate it from the artistic part of the site, and have made a different design for the software projects. 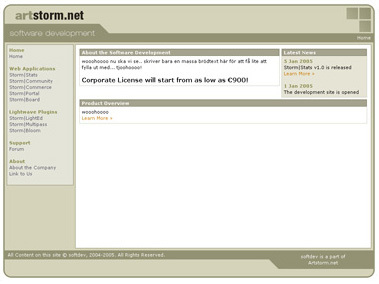 It will contain web applications, Lightwave Plugins and Windows Utilities. Storm|Stats will be the first software available there, which is one of the most advanced and sophisticated web analytics tools available. It’s currently in it’s last beta phase with me making sure it’s rock solid and sorting out the last things with some Flash presentations inside the app. It will be released the same day as the software development site opens.